You're going down... again. If you thought Descent went to the edge of 360° 3D power-blasting sensory insanity, then prepare yourself. 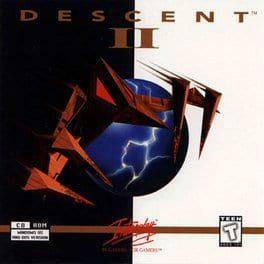 You're about to plunge over the edge, and into the depths of Descent II. Suddenly warped into the outer reaches of the Zeta Aquilae System, your new mission sends you into the black depths of treacherous alien mines. You blast through enemy robots with powerful new tools, leaving their flaming hulks in your exhaust. Your ultimate goal: to exterminate the alien robot stronghold from the enemy Alien Base and claim total control -- it's 30 new levels of outrageous destruction. Joining you on your deadly new assignment is your loyal Guide-bot. This faithful companion rushes with you through the twists and turns of the menacing darkness, often scouting ahead to hunt down the orbs, powerups and tools you desperately need to complete your job. But beware -- raging enemies are still determined to destroy you, including the menacing Thief-bot who's set on stealing your weapons of destruction and precious powerups. Get ready -- Descent II™ is about to take you on a whole new synapse-smashing ride. Descent II is available from 9.99 to 9.99 from 1 shops.